We keep a mixed flock. 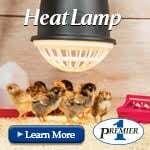 We have standard sized hens and bantams. Silkie Bantams to be exact, as we like to call them-our Chinese chickens. The standard girls are big and bossy. They are always the ones jockeying their position for food, treats and human attention. 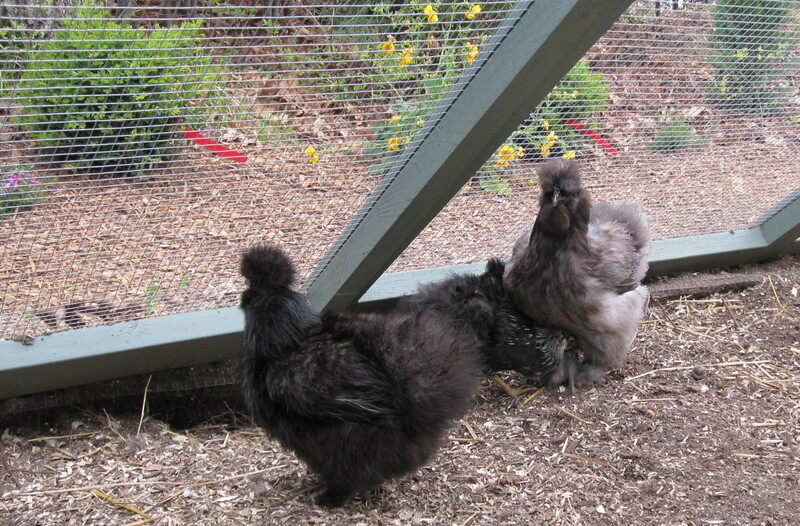 The little Silkies, all four of them, tend to keep a bit back. They don’t mind. They are completely content not taking center stage in our menagerie of chickens. It is almost as if they are a mini-flock within the larger flock. Sometimes, with all the brouhaha of Oyster Cracker continually jumping into my lap with an insatiable appetite for attention, Tilly chatting up a storm, and the chaos of treat time the Silkies are easy to overlook. Our three year old Silkie Hen, Dolly, has long time been one of my favorite girls. I know I shouldn’t play favorites but this little lump of fluff has found her way into my heart. I’m not quite sure if it is the way she mothers so beautifully or the gentleness about her. She is patient. She is kind and she is wonderful with the kids. She is giving and generous and keeps an eye out for the other Silkies. I have never told the kids about my personal feeling about her and the girls. I didn’t want them to know that I secretly had my favorites. Yesterday I had my eldest go out to the coop to let the girls out, toss in some scratch and check for eggs. 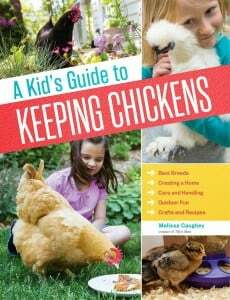 When he came inside, as the soon to be aloof double digit kid could only share…”You know Mom, I never realized this, but Dolly is one of my favorite hens.” I could feel my heart smile. 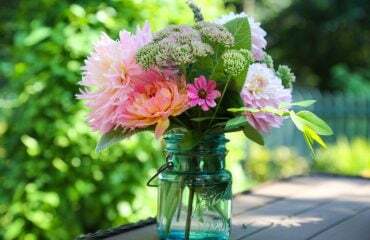 My heart was smiling because to a boy whose life is consumed with school, his peers and the normal pressures of growing up has taken the time to notice our small unassuming, easy-to-miss little hen. Sometimes it is the little things in life that really make the biggest impact. Love knows no size. Love has no boundaries except those that you place on it. Dolly and a baby Dottie Speckles hiding from Feathers as they explore the run. Poor Dolly, last week she went broody again. 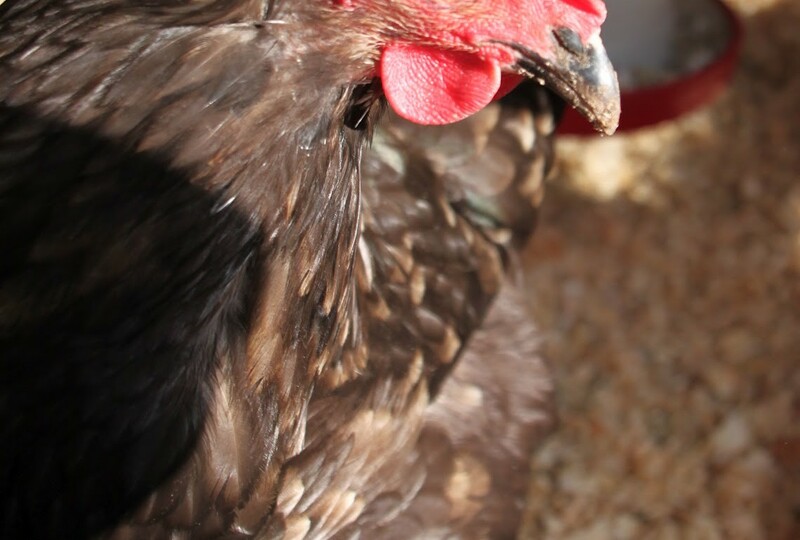 As most of you know, Dolly is our perpetually broody girl, only taking a few weeks off in between broody episodes to live and act like a normal hen. 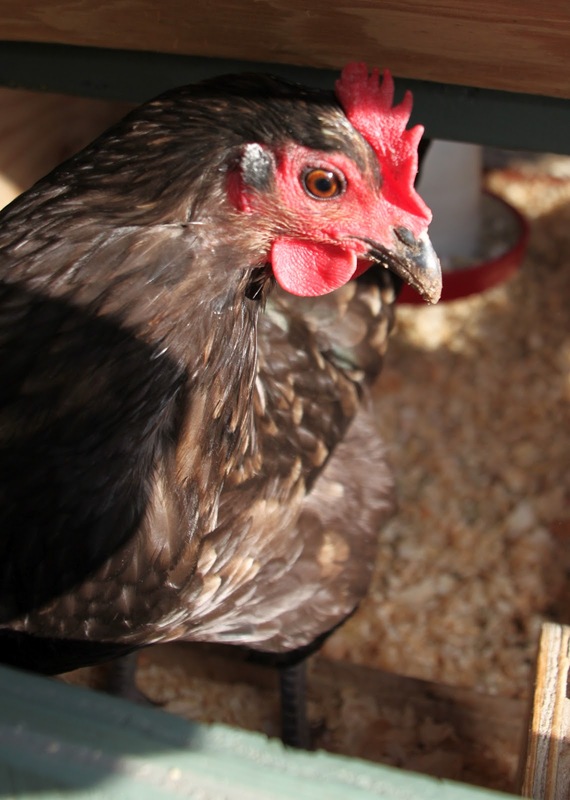 At all other times, you can find her sitting in one of the nesting boxes…waiting. 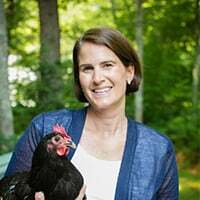 I like to think that she is like an egg coach for the other girls-like a Lamaze instructor to the other hens. Their eggs are treasures to her. She sits in her empty nesting box, ready for the others to arrive in the adjacent boxes to lay their eggs. I am sure at this point Dolly is just dreaming of those warm little eggs for herself. After the other girls vacate the boxes, Dolly stealthfully springs into action. Ever so sneakily she makes her way over to the other nesting boxes. 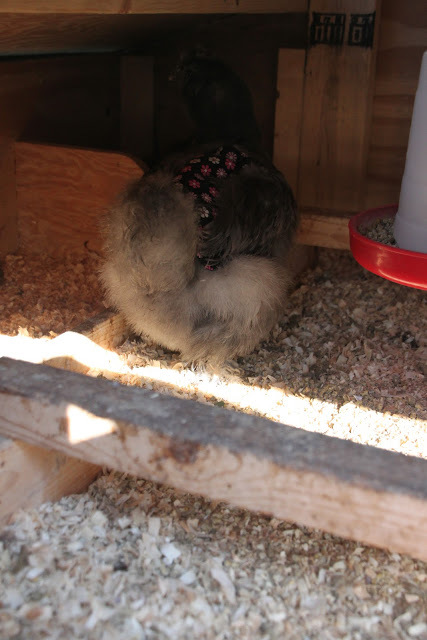 With her beak, she delicately rolls the warm sweet egg over the lip of the nesting box across the coop floor. She takes breaks, as this is very stressful work. The egg must stay intact. The other girls must not catch her in action. The others must stay out in the run, as she quickly steals the egg for herself. When I arrive at the nesting boxes in late afternoon, Dolly is sitting in her nest. 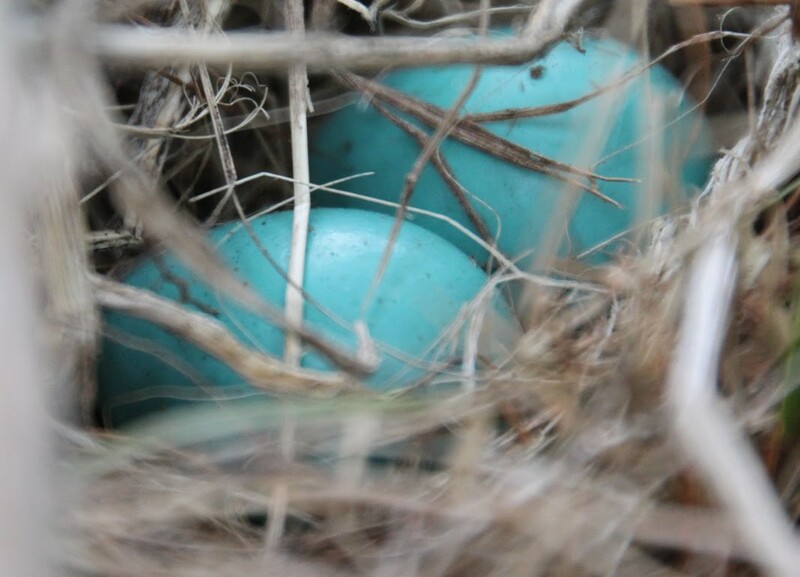 The other nesting boxes are vacant of eggs. She flattens out her body and poofs up. I know she has eggs. As I lift her up off the nest, an assorted collection of various eggs an array of colors, sizes and shapes are all warmly nestled together under her bare, feather plucked breast. And so it has gone each and every day that she has been broody for the past 3 years. At first I felt sad that I could not continually supply her with fertilized eggs for her to hatch. It weighed on my mind until I decided that sometimes, no matter what, you just can’t change the composition of individuals. Dolly is happy. Dolly is healthy and of a robust weight. For the most part, she is well loved by the others and an essential girl to the flock. We all would miss her terribly if she was not around and I love and accept her just the way she is. Sometimes, we envision how we think folks should live their lives or how we can make them better. Sometimes, it is best just to leave things as they be. She is happy and who am I to judge her? She makes her own choices about her life’s adventure. All I can continue to do is love, support and show her kindness no matter how frustrating the situation is to me. After all, broodiness just might be her reason for living. Perhaps some eggs will be in her future down the road when there is room at “the inn”. Dolly has no head feathers. She has been bald above the eyes for a while now. 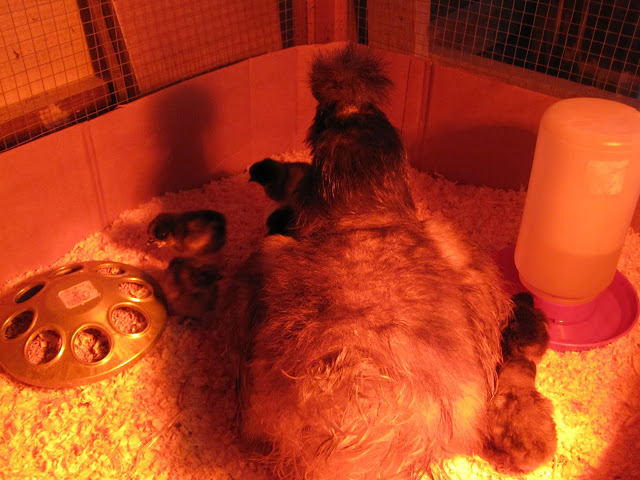 It all started in the spring, when she had one of her broody bouts; mind you she goes broody about every three weeks. That is just how Dolly is. It is a vicious cycle. Two days ago, I noticed that Dolly’s head feathers were finally returning again. Beautiful dark pin feathers were filling in the bald vacancies. They were about a half an inch long. 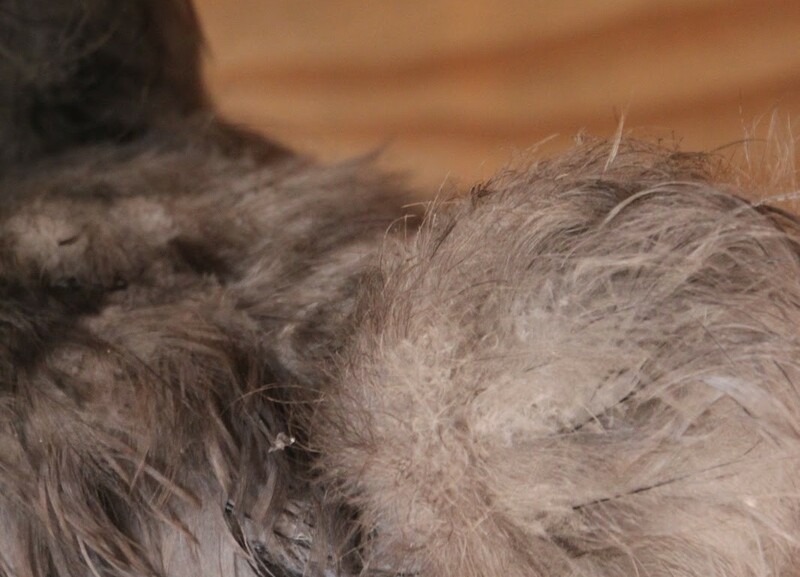 Was she finally going to have some poofy Silkie feathers? Alas it wasn’t meant to be. 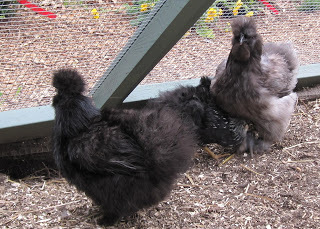 Silkies are funny little chickens. Last week, all four Silkies, Dolly, Autumn, Feathers and Fifi were broody. 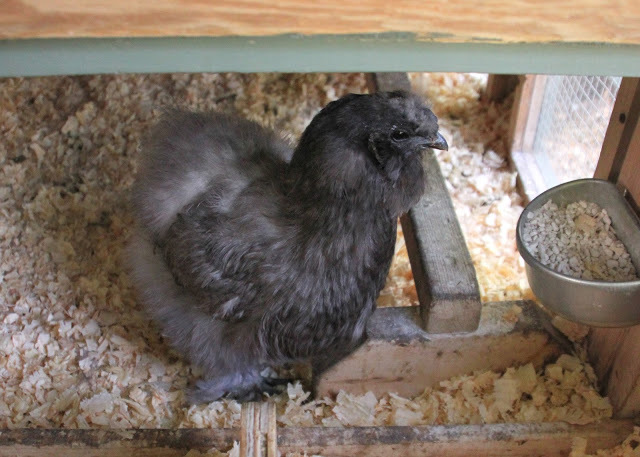 It doesn’t take much to convince a Silkie that they should be broody. Clearly this was the trendy thing to do this week. 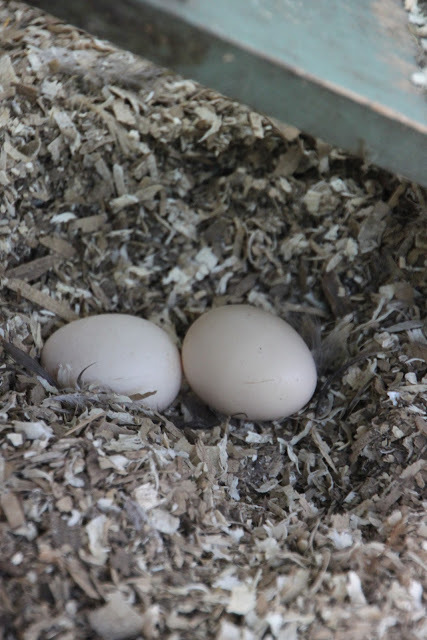 There they were piled on top of one another inside the nesting boxes. Toward the end of the week, Tilly decided to join them. For the past few days, one by one, the Silkies gave up being broody. It wasn’t as much fun having Tilly there sandwiched between the two boxes overflowing with Silkies. Tilly has been taking her time to decide if she truly wants to be broody or was just under the weather. It seems like the old chicken and the egg argument; which came first. This morning, Tilly was the last one out of the coop. I watched as they one by one popped out of the coop with a lust for life. Dolly and Tilly took some coaxing. I could hear them “talking” to their invisible chicks as I have heard mother hens do. They all came outside and were enjoying exploring the run. A pair of robins landed outside the coop. Tilly ran for them. Like a watch dog, she chased them away. They had no business being anywhere near the newly reseeded grass outside the coop. Life somehow seemed to be returning to normal for Tilly today. 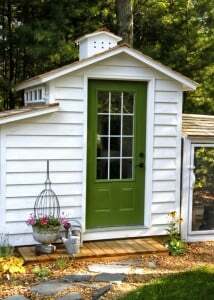 I went inside to finish up with the morning chores and returned about a half hour later to clean the coop. There, something caught my eye. Tilly and Fifi had returned to the nesting boxes. I had to remove them one by one and place them in the run. 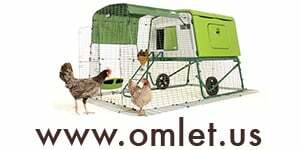 I always clean the coop without any chickens inside. There, I noticed underneath the coop ramp someone had made a nest. 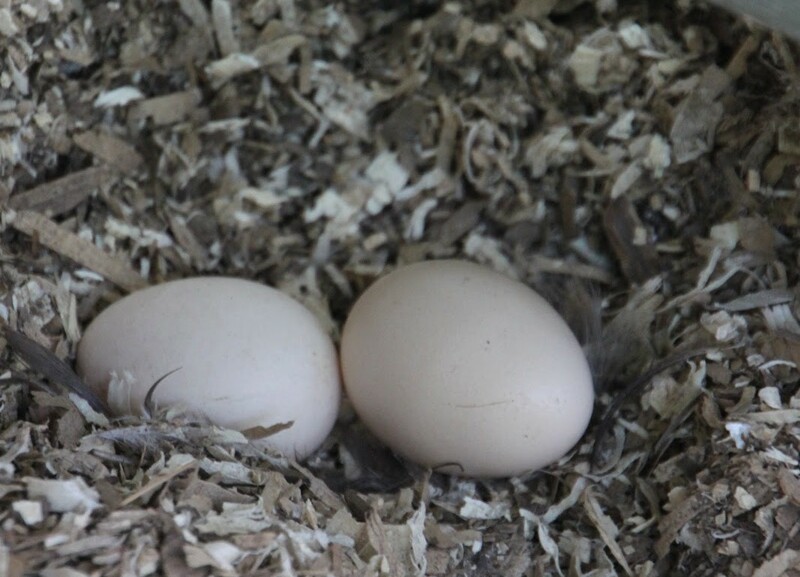 Two pearly little Silkie eggs were laid inside. 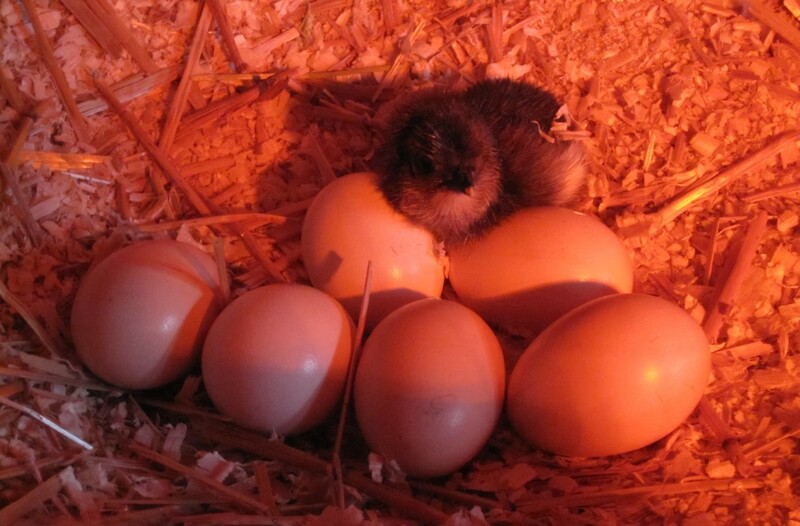 The eggs were tinier than usual, due to the Silkies returning to the egg laying process after being broody. I removed my coop cleaning gloves and gently scooped the still warm eggs up into the cradle of my hand. I was surprised that Sunshine had not discovered them. She is ruthless when it comes to discovering eggs that had not been laid by her. 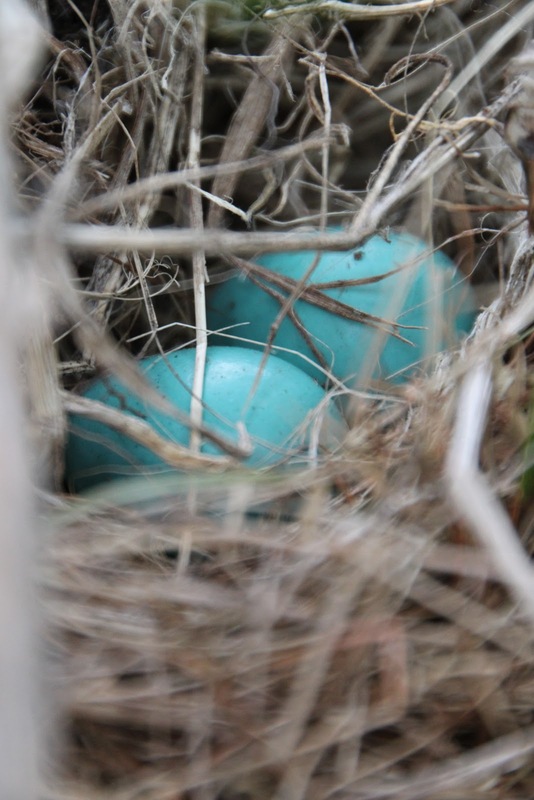 It is amazing to me that she recognizes her own eggs verses those laid by others. Tilly is quasi-broody. The Silkies are laying again. 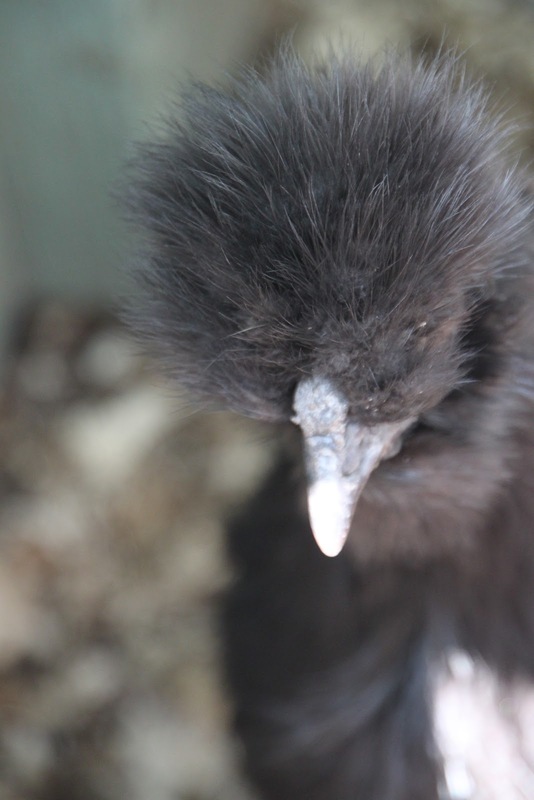 Sunshine did not use the Silkie eggs as kick ball. Somehow, things are off kilter, but make me feel content. Life isn’t how one would expect it but somehow, option B turns out to be just as good as option A. This morning around 9am I found Tilly sitting in the right nesting box. Sitting in the neighboring nesting boxes were Dolly and Feathers. Dolly and Feathers are both broody. I quickly checked beneath all of them for eggs. There were none, so I went on my errands for the morning. Robins return each year habitually to hatch eggs. Habits can be classified as good and bad. I think that we all tend to have both. Good habits can benefit us directly and some are even chore-like. When I think of good habits, I think of brushing my teeth, setting a bed time, eating healthy (or at least trying to), catching the school bus in the morning, going to church, or regularly meeting a friend for coffee. Good habits can also be chores, such as paying the bills, mowing the lawn, cleaning the house and cooking dinner every night. Unfortunately, we all have bad habits too. I think of young kids picking their noses. Biting our nails. Chewing with our mouths open. I happen to pick my cuticles and hangnails. 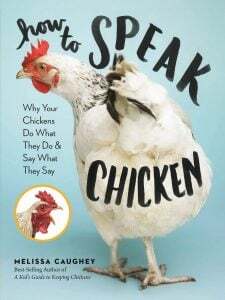 Interestingly, I have noticed that chickens also have both good and bad habits. Their bad habits include kicking shavings into the water, emptying their feed dish, hogging the roosts, sleeping in the nesting boxes and eating eggs (gasp)! Their good habits include rising early in the morning, running out first thing to have some scratch, going to sleep at night and carrying on conversations with me. Tilly’s best habit is the job she does as head hen. Every evening, she is always rounding up everyone and making sure that they are all in for the night. Her bad habit is being mean to the Silkies. Sometimes, she tends to overreact. Oyster Cracker’s best habit is always being first to greet me at the run door. Her worst habit is repetitively jumping into my lap when our quality-time session was only supposed to last a few minutes. Sunshine’s worst habit is pecking my hand very hard when I hand feed the girls scratch. You’d think she had to make a kill before she ate. Her best habit is being Oyster Cracker’s inseparable best friend. Dolly’s best and worst habit is always being broody. Autumn’s best habit is surveying the run first thing in the morning before dining on any scratch. She seems to be checking that the perimeter is secure, or…she could be trying to escape. Her worst habit is sleeping in the nesting boxes. Feathers’ worst habit is pecking at my jewelry. Her best habit is being my most friendly Silkie. Fifi’s worst habit is pretending to be broody and faking me out at least once a week. She sure does put on a show, complete with growling, tail in the air and the classic poufing up. Her best habit is taking care of her feathers. 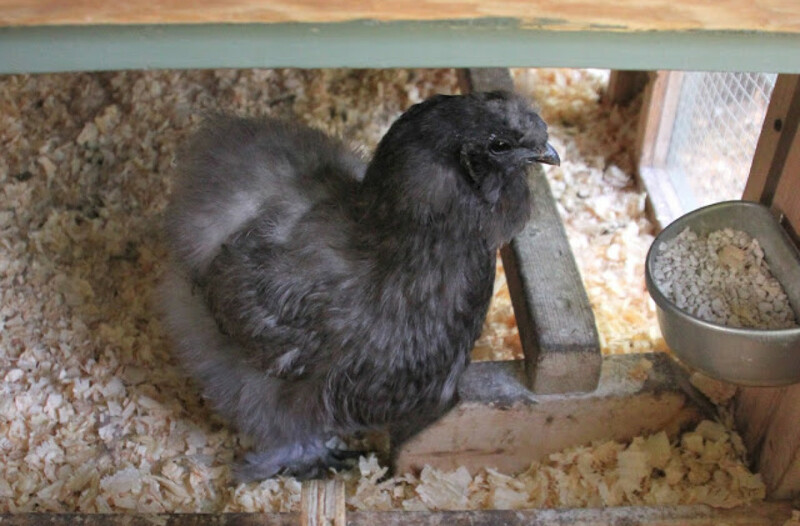 She is the fluffiest little girl for a non-show quality chicken. If you look closely and observe most species, you will find that they over time develop patterns and repeat things. Some say that routine is familiar and familiar feels good. Others say that sometimes things are merely according to schedule. Animals instinctively fill roles that aid in survival. People, I believe, are the only ones with the power of insight to change them or at least add one new good habit to out-number our bad ones. 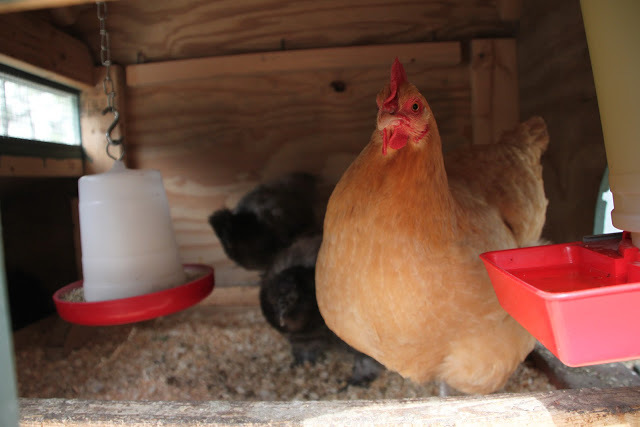 Proud Momma Dolly looks over her little ones as they eat, drink and explore in their private brooder. We are away this week visiting Mickey! Feel free to leave comments and captions for this week’s photos. I can’t wait to read them all when I come back. In the meantime, I hope you enjoy this week of photos. 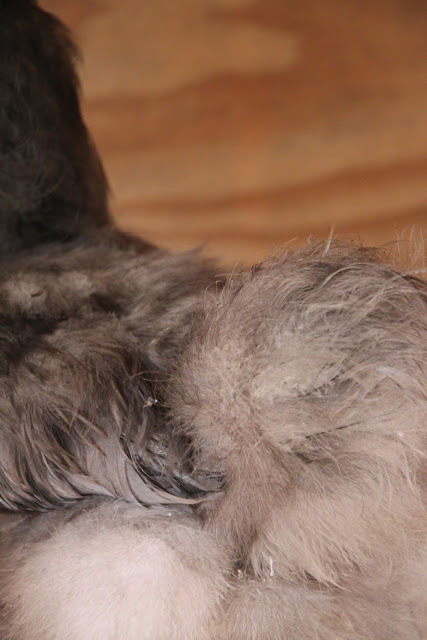 Silkie Bantams frequently go broody. Broody hens are quite interesting. 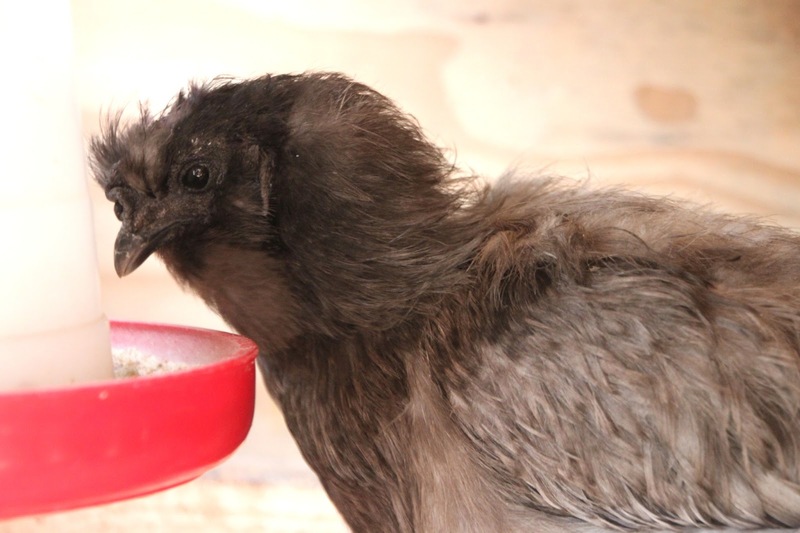 Dolly, one of our Silkie Bantams, seems to be broody about every 8 weeks. Thus, we have developed a broody routine. A couple times a day, I remove her from her nesting box and set her out into the run with the rest of her flock to scratch and peck and take a drink. Usually, I lift her from the nesting box, set her on the ground, lock up the box and then place her in the run. However, yesterday, she preferred to free range instead of going in the run. Usually, I can call her and she will come right back to me. Yet, I think the beauty of the weather and the 66 degrees, enticed her to scratch and enjoy a little freedom. I can’t blame her. I know scratching in the woods and leaves is one of the girls’ favorite activities. Today I removed the hen saddle from Dolly. Just as expected, it took three weeks for her wound to heal and new feathers to return. Her feathers have grown back beautifully. Truthfully, I was a bit sad to remove the hen saddle from her. When it was on, she didn’t seem to mind it and she just looked so darn cute. My kids loved the fact that she was wearing an outfit just her size! In addition to the hen saddle, we also treated her wound with Vetericyn spray gel and fortified her diet with Manna Pro’s Poultry Conditioner. 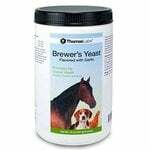 The Vetericyn gel helped to speed up the healing process and prevented the wound from becoming infected. 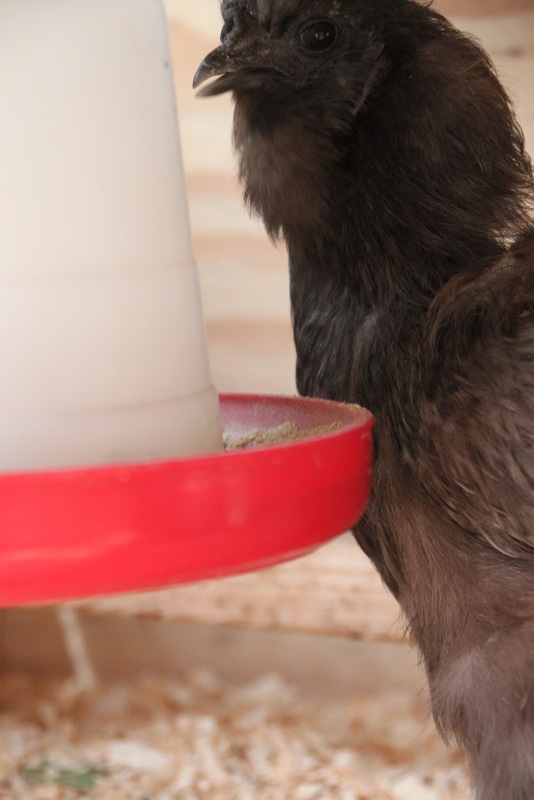 We used the The Poultry Conditioner to boost her nutrition aiding her to regrow gorgeous feathers. Just as I was finishing taking photos of Dolly for this post, in came my camera hog, Oyster Cracker. Dolly and Autumn continued to have a mid-morning snack while Oyster Cracker wanted love. Soon enough, she hopped out the coop door into my lap. 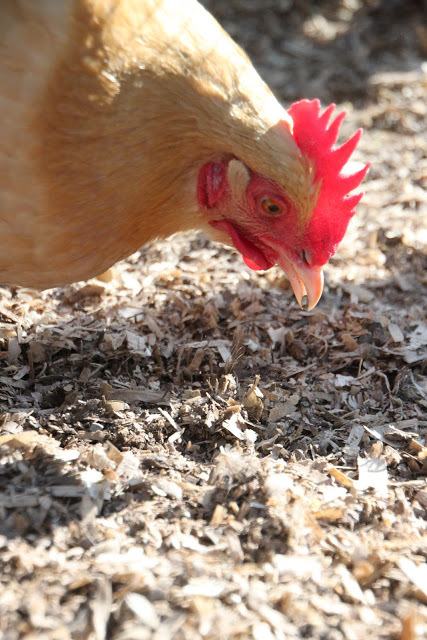 Dolly and Autumn left the coop and settled in to take a nice dirt bath. It is so nice to have our Dolly happy, healthy and feeling good again. It was also nice to get a bit of love from my snuggle chicken. What a wonderful way to start the weekend. Oyster Cracker holds a seed in her beak. March certainly has come in just as always, like a lion. 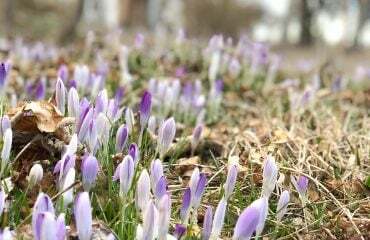 The first few days of March have brought us colder temperatures, freezing rain and little sunshine. Last night it dipped down to 19 degrees F. I could not seem to warm up. This morning, the air is still cold, in the twenties, yet the sunshine is brilliant. I heard the girls calling early this morning. I think they could not wait to get up and play in the sun. They love to sit perched on a roost, a top a log or in a dust bowl where they close their eyes and absorb the sun. They remind me of cats that find a sunny spot and curl into a ball to take a nap. Sometimes, they are alone and sometimes they snuggle together in their sunny spots. However, first eggs needed to be laid and their morning scavenger hunt for a bit of scratch, dried meal worms and sunflower seeds had commenced. Each morning, as the chickens scratch in the run for treats, I take a daily assessment of each girl. Are their combs bright and red and free from frostbite? Is everyone out of the coop? Do they all seem perky? Are they acting normal? Does anyone have a droopy tail or anything else out of the ordinary? Are they making normal poop? Thankfully, most days the answers are yes, business as usual continues. Dolly’s feathers are almost completely grown in and you would never know that she had been wounded in the first place. She has resumed laying eggs again. This is how I know that she has made a full recovery. She is her happy peppy self and I imagine she should return to being broody in about a week’s time. For Dolly, being broody is a year round never ending cycle. Dolly decides on a box to lay her egg. The days are getting longer. The sunset is delayed a bit as each day comes to a close. This weekend the clocks will “spring forward”. 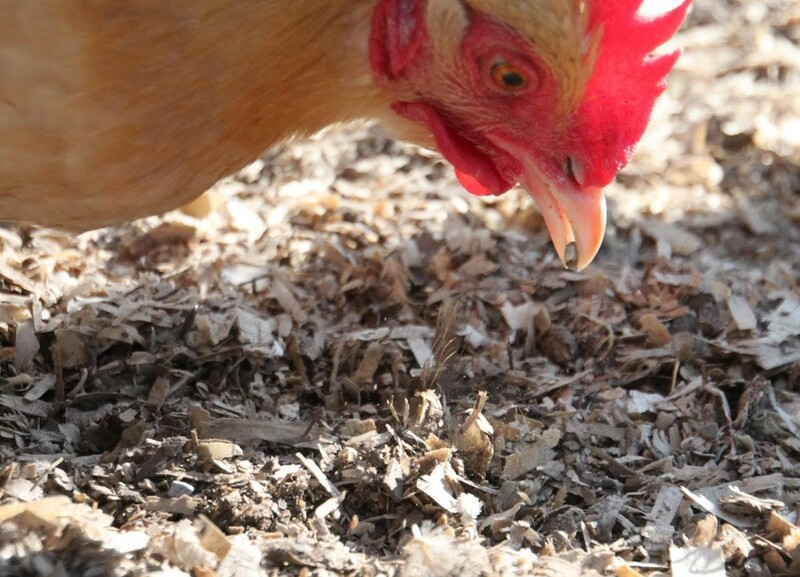 The chickens seem happier as they seem to know that Spring is around the corner. 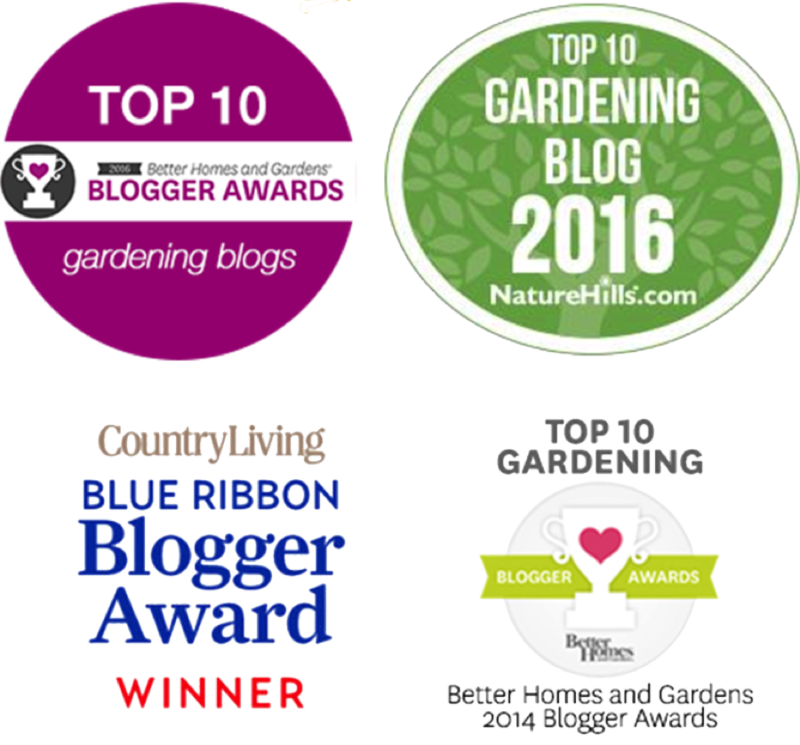 I love these times as the chickens will be able to spend more time out in the gardens. I too will be able to spend more time with them. One of my favorite things is waking the gardens up from their Winter slumber. I spend most Spring days in the gardens clipping back last year’s growth and discovering delicate buds of life emerging from the ground. The chickens helps me aerate the mulch and can’t help digging along side of me. I love it when the flock stays close. We talk, share found worms and often I am forced to take a break when my lap chicken, Oyster Cracker, is in desperate need of a snuggle. I can’t wait for the “out like a lamb” days.